Note from September 20, 2017: Based on customer feedback, we have moved the process outlined in this post to the official AWS documentation. AWS Identity and Access Management (IAM) has a list of best practices that you are encouraged to use. 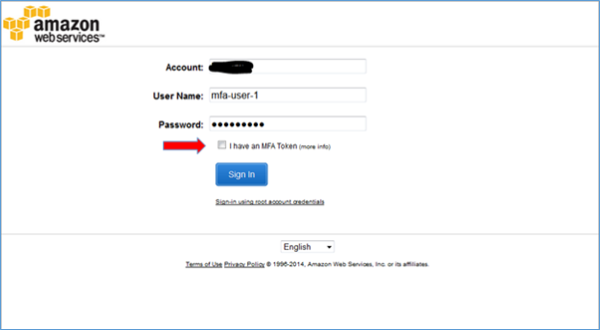 One of those best practices is to enable multi-factor authentication (MFA) for your AWS root account. MFA verifies your identity through something you know (user name and password) and something you have (MFA hardware or software token). Enabling MFA for one account is a simple process, and setup on the root account typically only takes a few minutes. But what about large-scale administration of MFA? Centralized provisioning and management can be tedious and scales poorly. Even so, the value of MFA-secured access demands a workable approach for securing your AWS assets. This post will show you how to grant your users access to provision and manage their own MFA devices while not allowing them access to any AWS resources until they authenticate via their newly provisioned MFA device. The following diagram shows the workflow that this blog post follows. You can create IAM users and then add them to groups. Then, you can create and attach policies to those groups to control several different AWS features. You can attach two types of policies to a group. The first is called a managed policy, and the second is called an inline policy. 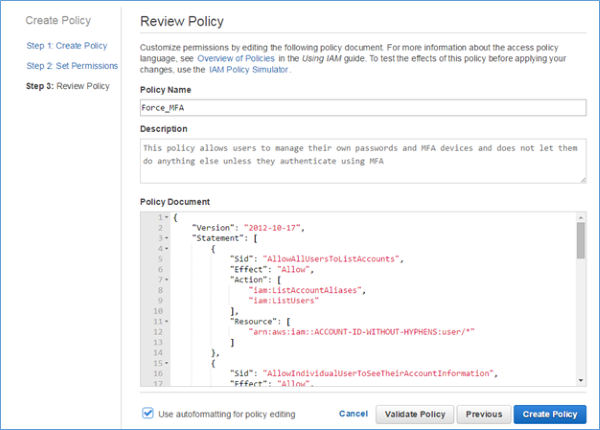 Managed policies are policies that you can attach to multiple users, groups, and roles in your AWS account. 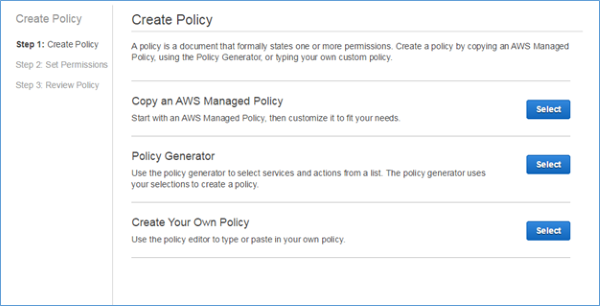 In this post, you will use two managed policies: one of the AWS managed policies, and a customer managed policy that you will create. The following image shows a check mark next to a group that has an inline policy attached to it. To get started, you will create two example groups. The first group will be called EC2_Full_Access and the second group will be called Force_MFA. The EC2_Full_Access group will use the AWS managed AmazonEC2FullAccess policy that grants full access to all EC2 resources. The second group, Force_MFA, will have a custom policy attached to it that will grant users access to a subset of IAM privileges, such as managing their own password and enabling an MFA device for themselves. When a user is added to both of these groups, it will have the effect of granting the user EC2 full access only after they have successfully authenticated with an MFA device configured for their account. To get started, go into the Groups section of the IAM console, and then click New Group. Name the new group EC2_Full_Access (as shown in the following image), and then click Next. The next page will ask you to attach a policy. 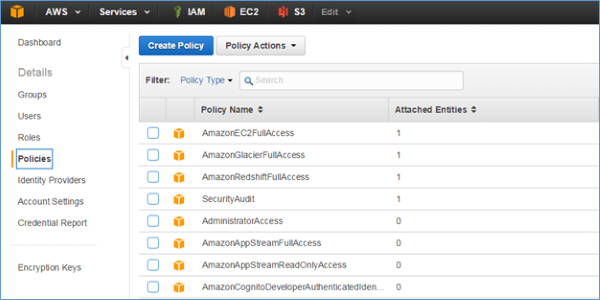 Type ec2 in the Filter box to see a list of AWS managed policies related to EC2, as shown in the following image. 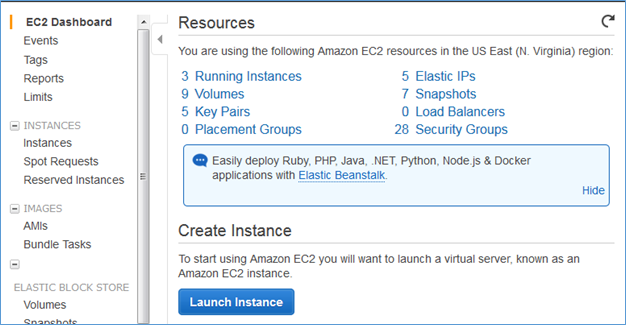 Select the policy called AmazonEC2FullAccess, and then click Next Step. Make sure the settings you want are in place. Finally, click Create Group to finish creating the EC2_Full_Access group, as shown in the following image. You will follow the same steps to create the Force_MFA group except that you will not select a policy, but will instead create your own policy in steps outlined later in this post. At this point, you should see both new groups in the Groups section of the IAM console. The next steps involve creating a managed policy and configuring it. First, click Policies. Then click Create Policy. Note that for Attached Entities you will see numbers specific to your account that may not match what is shown in the previous image. Go to the bottom of the page to the Create Your Own Policy section, as shown in the following image. Then click Select. Give the policy a meaningful name and description. For this example, call the policy Force_MFA, and in the description note, “This policy allows users to manage their own passwords and MFA devices.” You can copy and paste this IAM policy document template into the Policy Document section. Be certain to change the places where it says ACCOUNT-ID-WITHOUT-HYPHENS with your own AWS account ID. If you do not know your AWS account ID, follow these steps to find it. Click the Validate Policy button (shown in the previous image) to make sure that there are no errors, and then click Create Policy. If you do encounter an error, check that you copied the text correctly from the IAM policy document template. The policy document is broken into several areas. For more information about what each of these areas does, see the IAM Policy Elements Reference and IAM documentation. 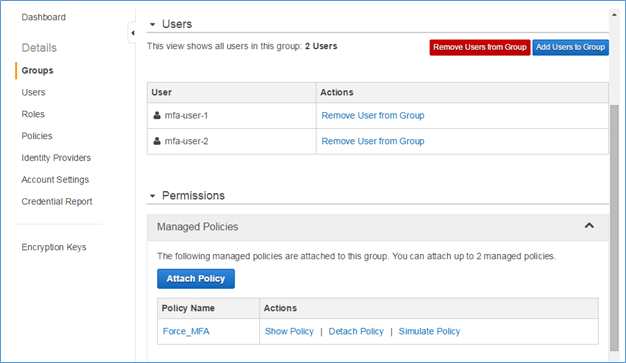 Now that you have the groups and policies set up, you will attach the customer managed policy called Force_MFA, which we created previously, to our new custom groups. Then, you can add existing users or create new users, and add them to your groups to test things out. First, go back into the Force_MFA group, as shown in the following image. 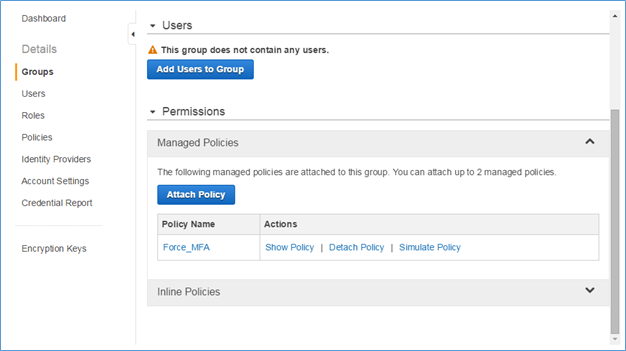 In the Force_MFA group, click Attach Policy in the Managed Policies section. Type Force in the Filter box, as shown in the following image. Attach the Force_MFA policy we created earlier by clicking Attach Policy. Create test users called mfa-user-1 and mfa-user-2, as shown in the following image. 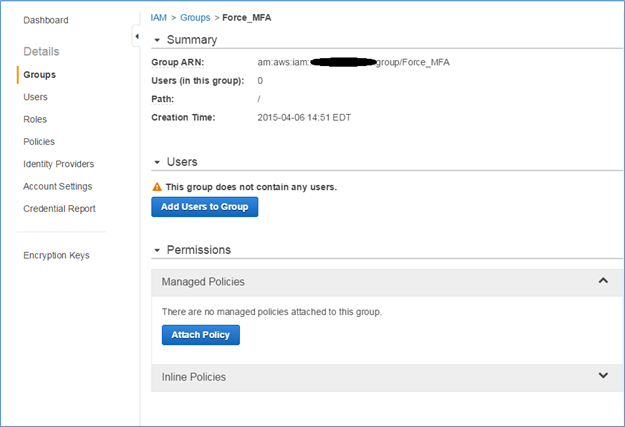 Add them to the Force_MFA group first, and then add them to the EC2_Full_Access group. You can use your own existing users, or create new ones and add them to the groups. Be sure to add the users to the Force_MFA group first so that you do not inadvertently give the user full EC2 access before locking them down with the MFA restrictions. At this point, you should have two test users added to two groups, as shown in the following image. Next, try to sign in as one of these users and provision an MFA device for the user. Browse to the URL you would use for signing in with IAM users. It will generally follow the form of https://ACCOUNT-ID-WITHOUT-HYPHENS.signin.aws.amazon.com/console. If you are not sure which sign-in URL to use, you can find it for your account by reviewing this documentation. On the sign-in page, specify one of the IAM users you added to the two groups earlier. 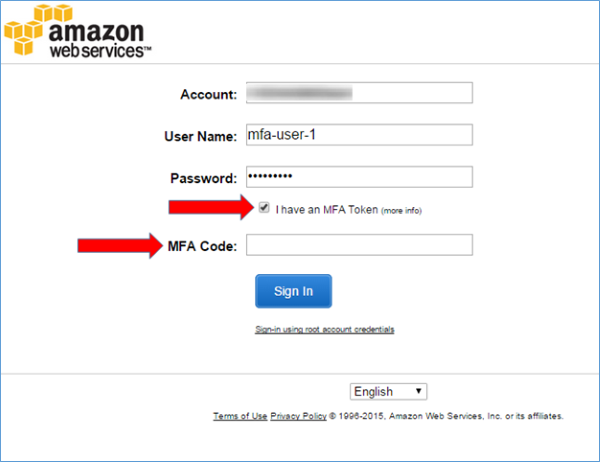 Because this user does not have an MFA device yet, you must clear the I have an MFA Token check box, as shown in the following image. You will set up the MFA device later in this post. 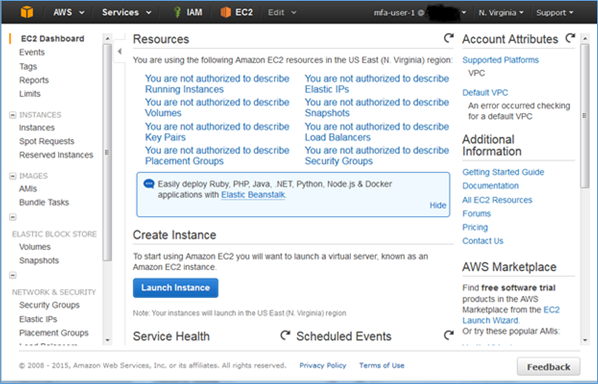 After you have signed in, go to the EC2 Dashboard and note that you should not have access to any resources, as shown in the following image. To gain access to the resources, you must first configure an MFA device, and sign in again using the MFA device. To do so, proceed to the IAM console. Note that you will now see several permission “not authorized” errors, which is expected because the user has been granted access to a limited set of IAM resources. Next, go in to the Users section in the IAM console, and then click the user that you used to sign in. Click Manage MFA Device (as shown in the following image), and follow the instructions to configure a virtual or physical MFA device. Sign out of the AWS Management Console. Next, sign back in as the modified user. This time select the I have an MFA Token check box, as shown in the following image. Enter your account information and the MFA code that is displayed on your device. You should now have access to the EC2 Dashboard, which was inaccessible until you configured an MFA device and signed in to the AWS Management Console by using that MFA device. By default, the rule is deny. In the Force_MFA policy, we explicitly allow the user permission to make some IAM API calls. The user can do nothing else with IAM other than these allowed actions. An explicit deny overrides an explicit allow. 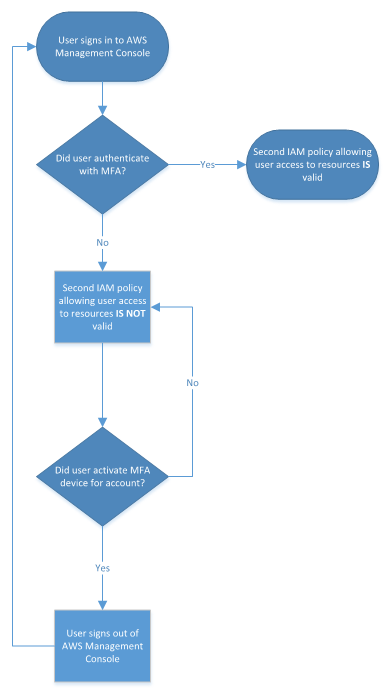 In the Force_MFA policy, we explicitly deny access to anything other than “iam:*” if the user has not logged in with an MFA device (using a Condition policy construct, and checking for the absence of the “aws: MultiFactorAuthAge” dynamic variable, which is only set when the user logs in using an MFA device). This explicit deny is what prevents users from having access to EC2 resources, because it overrides any allow statements in all other policies (including EC2_Full_Access). This blog post has shown you how to enable your users to provision and manage their own MFA devices while not granting them access to any resources until they have authenticated via their newly provisioned MFA device. By doing this, you take the task of large-scale administration of MFA devices from the job of your administrators and delegate it to your users. We look forward to hearing how you are using IAM and MFA for your users and the ways we can improve the functionality. You can post comments below, or visit the IAM forum to post comments and questions about managed policies.